Circadian rhythmicity of physiological processes in animals has been described for some variables. In order to investigate the daily rhythmicity of blood pressure, seven foals (Equus caballus) were used for 40 days after birth. Measurements of blood pressure were done by means of an oscillometric apparatus (Argus TM-7, Schiller, Barr Switzerland) with the foals in a standing position and the cuff placed around the tail. Blood pressure was recorded twice a day, 1 hour before dawn and 1 hour before dusk for the first 10 days of life, every 2 days from the 11th to the 32nd day, on the 36th and on the 40th day. Two-way repeated measures analysis of variance (ANOVA) were used to determine statistically significant differences between the mean values recorded at dawn and dusk during the study. Analysis of variance showed a significant effect of time (p<0.0001), during the first 40 days of life. This study confirms a strong correlation between age and blood pressure in horse and the absence of blood pressure maturation in foals 40 days old. The results on the maturation of the daily rhythm of blood pressure in foals is a contribution to the study of the development of circadian rhythms in mammals. These results are also useful for the chronophysiological assessment of blood pressure in the horse. Key terms: blood pressure, circadian rhythm, chronophisiology, foals, Equus caballus. Circadian rhythmicity in physiological processes in animals has been described for a multitude of variables (Piccione and Caola, 2002; Dunlap et al., 2004; Refinetti, 2005). Daily rhythmicity is generated by a circadian pacemaker located in the suprachiasmatic nucleus of the hypothalamus, which is modulated by environmental cycles of light and darkness, food availability, ambient temperature, and other factors (Van Esseveldt et al., 2000; Helfrich-Förster, 2004). Circadian rhythmicity implies that under constant external condition (without time cues) the rhythms free-run with an endogenous period are close but not identical to 24 h.
Several physiologic rhythms, including those of the cardiovascular system, react to both endogenous and exogenous influences (Guo and Stein, 2003). As many other physiological functions, blood pressure shows significant temporal variations. The large extent of spontaneous change within the physiologic range of blood pressure can be resolved and should be exploited. In man, it is well known that there is a gradual rise of blood pressure (Comstock, 1957; Eilertsen and Humerfelt, 1968; Hamilton et al., 1954); it is evident that heart rate variability, as well as effects of blood pressure variability, seem to be influenced by age, health status, and nutritional factors (Singh et al., 2003). It is possible to predict this variability, since it shows a rhythmic pattern. Among the temporal rhythms, circadian progress mainly is characterized by systolic and diastolic pressure. A circadian rhythm in blood pressure has been demonstrated in various species of mammals, including rat (Van Den Buuse, 1994; Sato et al., 1995), rabbit (Sato et al., 1995), cat (Brown et al., 1997), dog (Mishina et al., 1999; Piccione et al., 2005a), cattle (Fazio et al., 2002), marmoset (Schnell and Wood, 1993) and mouse (Gross et al., 2000). Many reseachers have reported that cardiovascular indices, like sympathetic activity increase significantly during the day and decrease during the night; parasympathetic activity does the opposite (Veerman et al., 1995). Circadian blood pressure rises at night in rats, which are nocturnal (Baumgart, 1991; Buuse, 1994; Conway et al., 1983; Friberg et al., 1989; Ittersun et al., 1995; Kawano et al., 1994; Mancia et al., 1993). Some studies, carried out on dogs, reported low mean BP throughout the night to early morning and high BP from early morning and throughout the day (Broten et al., 1988). 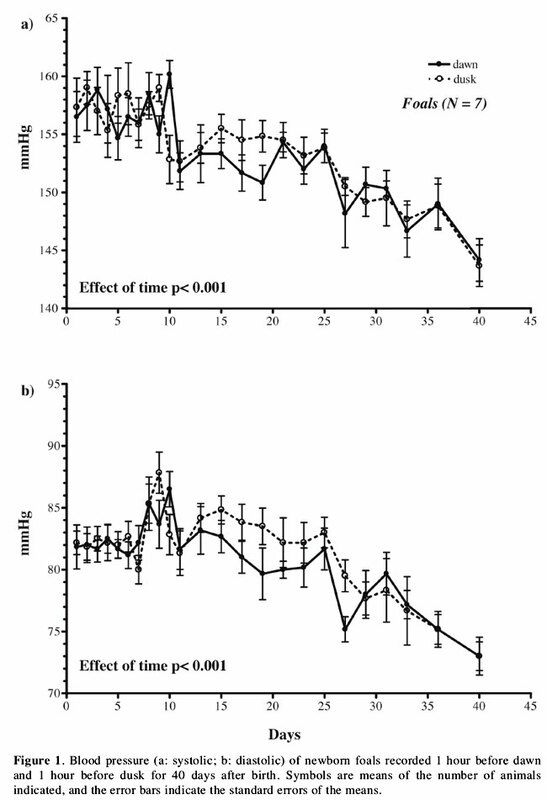 Other authors (Mishina et al., 1999) have monitored the 24-h BP in dogs using telemetry and observed changes almost identical to those reported in humans (Baumgart, 1991; Mancia et al., 1993; Sundberg et al., 1988) with the highest values during periods of activity and the lowest during sleep. especially in horse, the aim of our research is to define the temporal organization of the cardiovascular system, taking into particular consideration the circadian pattern of blood pressure and the maturation of the daily rhythm in newborn foals. Seven Thoroughbred foals (Equus caballus) (mean body weight 50 kg) were used for 40 days after birth. Mother's milk was the only source of food for the foals. Each foal was maintained in a separate indoor stall. Horses were kept under natural photoperiod and natural indoor temperature. The study was conducted in the early spring in Sicily, when the photoperiod consists of 11-12 h of sunlight per day, and the average indoor temperature is 19°C. Recordings of blood pressure were done by means of an oscillometric apparatus (Argus TM-7, Schiller, Barr Switzerland) with the foal minimally restrained in a standing position. The blood pressure obtained can be corrected to the heart base level. A pneumatic rubber cuff was placed around the base of the tail, and the transducer part of the flow detector was centred squarely over the middle coccygeal artery at the base of the tail. The cuff was secured snugly, as close to the body as possible, using the Velero self-adhesive cloth sleeve covering the cuff. Any hair interfering with a good connection between the transducer and the skin was removed. The cuff was automatically inflated and deflated at regular predetermined intervals. Blood pressure was recorded from each animal twice a day, 1 hour before dawn (07: 00) and 1 hour before dusk (17: 00) for the first 10 days of life, every 2 days from the 11th to the 32nd day, on the 36th and on the 40th day. Blood pressure reflects the activation of the adrenergic system and the adrenal cortex preparing for the start of the day's motor activity (Cornélissen et al., 1994). These times were chosen because they correspond to the trough and peak, respectively, of the daily rhythm of motor activity in mammals maintained under a photoperiod with 12 h of light per day (Refinetti, 1999). Blood pressure values (systolic and diastolic) were not recorded until three measurements could be taken at 15 min intervals without varying more than 10-15 mmHg. Mean arterial blood pressure was obtained directly from the oscillometric apparatus. Feeding never preceded the measurement of blood pressure by less than 4h. All work presented here complies with current regulations covering animal experimentation in Italy. The results are expressed in mean±SEM. Two-way repeated measures analysis of variance (ANOVA) were used to determine statistical significant differences between the mean values recorded at dawn and dusk during the study. Main effects associated with probalities equal to or lower than 0.05 were considered statistically significant. Figure 1 shows the pattern of systolic and diastolic blood pressure in foals. 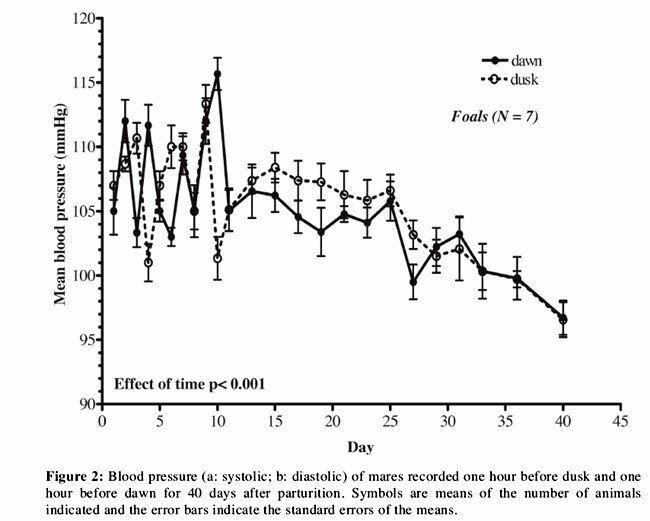 The two-way ANOVA showed statistically significant effects of time, during the first 40 days of life, as follow: systolic pressure F(23,.276) = 12.03, p<0.0001, diastolic pressure F(23,276) - 11.46, p<0.0001, mean blood pressure F(23,276) - 1-58, p≤ 0.047. It no showed a statistical significant difference between dawn and dusk: systolic pressure F(1,.276) = 3.04, p=0.10, diastolic pressure F(1,276) - 4.59, p=0.053, mean blood pressure F(1,276) - 0.18, p=0.67. Systolic pressure decreased 1 hour before dawn from 156.50 ± 2.18 mmHg (1st day of life) to 144.10 ± 1.83 mmHg (40th day of life); diastolic pressure decreased from 81.83 ± 1.77 mmHg (1st day of life) to 73.00 ± 1.15 mmHg (40th day of life); mean pressure decreased from 105.00 ± 1.82 mmHg (1st day of life) to 96.72 ± 1.32 mmHg (40th day of life). Pressure measured 1 hour before dusk changed as follow: systolic pressure from 157.30 ±2.51 mmHg (1st day of life) to 143.67 ± 1.78 mmHg (40th day of life), diastolic pressure from 82.16 ± 0.94 mmHg (1st day of life) to 73.00 ± 1.52 mmHg (40th day of life); mean pressure from 107.00 ±1.11 mmHg (1st day of life) to 96.56 ± 1.36 mmHg (40th day of life). By the 33rd day of life, the difference of systolic pressure recorded between the dawn and dusk was approximately 1.50 mmHg, except a the 5th and 10thday after birth; diastolic pressure was approximately 0.80 mmHg, except on the 5th-6th day and 9th-10th day after birth. Our results show the absence of a circadian rhythmicity of blood pressure in up to foals 40 days old, contrary finding for body temperature in sheep and horse, in which a body temperature rhythm similar to that of adults is achieved approximately 10 days after birth and fully matures during the first month of life (Piccione et al., 2002). As showed by other authors (Covington and McNutt, 1931; Ostlund et al., 1983), our study confirms a strong correlation between age and blood pressure in horse. During the 1st day of life, mean blood pressure had a value of 105.00 ± 1.82 mmHg at dawn and 107.00 ±1.11 mmHg at dusk, which is also consistent with previous observations (Drummond, 1990). This high value recorded following the post-partum period is due to the highest activity of the RAA (Renin-Angiotensin-Aldosterone) system during pregnancy, fetal and neonatal life (Guignard, 1982; Carr and Gant, 1983; Pipkin, 1984). Towards term in the horse fetus, the increase in arterial blood pressure occurs together with reductions in metatarsal vascular resistance, elevations in plasma concentrations of cortisol, vasopressin, and noradrenaline and falls in the fetal/maternal ratio of blood P02 (Giussani et al., 2005). Once the lung expands and P02 increases pulmonary blood flow increases ten-fold. Meanwhile, the placental circulation is eliminated, converting the systemic circulation from a low-resistance system to a high-resistance system (Lombard, 1990). The foals' mean blood pressure 40 days after the birth was approximately 5 mmHg higher than that of one adults (Drummond, 1990), because of the immaturity of autonomic nervous function, as in children (Massin et al., 2000) and calves (Fazio et al., 2002). The circadian rhythm of blood pressure is widely affected by the activity of the autonomic nervous system and by circadian fluctuations of the following systems: endogenous oppioids, hypothalamus-hypophysis axis, renin-angiotensin-aldosterone complex, renal function and vasoactive peptides (Portaluppi et al., 1990; 1992; 1993a; 1993b; 1996). The activity of the renin-angiotensin system also has a circadian rhythm, with a diurnal acrophase, as widely showed in laboratory animals (Lemmeer et al., 2000), and the pattern of its circadian rhythm coincides with the circadian pattern of heart rate and blood pressure, which also demonstrates diurnal acrophase (Kawasaki et al., 1983; Cugini et al., 1985). Ten-day-old lamb and foal both show a circadian rhythm of body temperature. This rhythmicity is lacking in blood pressure, as previously observed for heart rate and respiratory rate (Piccione et al., 2005b), may be caused by different control systems, and probably correlates with the incomplete anatomical-functional development of the cardiovascular system. Blood pressure can be considered not only as part of the maturation process, but may be also connected with the horse's age (Ostlund et al., 1983). The results on the maturation of the daily rhythm of blood pressure in foals are a contribution to the study of the development of circadian rhythms in mammals. These results are also useful for the chronophysiological assessment of blood pressure in the horse and for pharmacological applications. The rise in blood pressure showed in horse and linked to the animal's age, probably starts after the maturation period, in which it is possible observed the opposite phenomenon, that is, a gradual decrease of blood pressure from birth to about 40 days of life. This can be considered part of the aging process or as a common phenomenon among mammals. The absence of a daily rhythmicity of blood pressure in foals to 40 day after birth could be due to the incomplete maturation of endogenous process, thus further studies are needed in order to define the maturation of the cyclic rhythm of blood pressure.